Focusing directly on the world of commercial images, he asks some basic questions about the cultural messages emanating from this market-based view of the world: Do our present arrangements deliver what they claim -- happiness and satisfaction? Can we think about our collective as well as our private interests? And, can we think long-term as well as short-term? 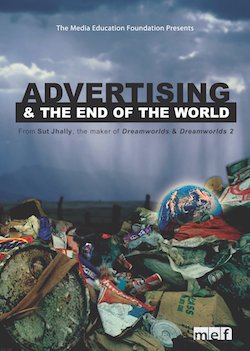 "Sut Jhally's eye-opening Advertising and the End of the World is the one single indispensible videotape anyone interested in advertising should see." "A brilliant deconstruction of consumerism. Like a martial artist who deftly redirects his assailant's energies, Sut Jhally turns Madison Avenue against itself. This film reveals not only the enormous power of advertising, but also its essential weakness: transparently false promises of love, friendship, and happiness packaged in commodity form." "Powerful, compelling, and disturbing -- a devastating and seamless critique of advertising. Sut Jhally is one of the most important and intelligent critics of commercialism in the world today... A 'must see' video for anyone interested in media, advertising, or economics." "Offers excellent social psychological and critical perspectives on the role of advertising in contemporary society... Here, focus is on concepts of hegemony, identities, commodities, the power of the image, and the social production of consciousness. Jhally argues that advertising's promise of 'the good life' through the purchase of products is a false one. Students relate well to this."